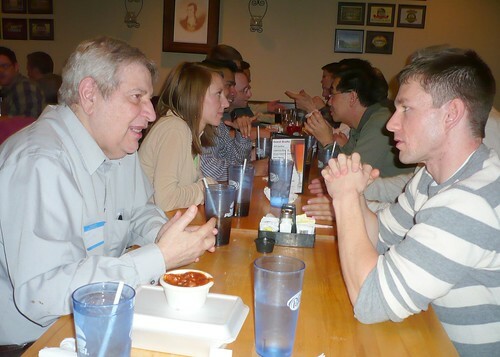 We had our monthly Web Analytics Wednesday meetup at Barley’s Smokehouse and Brewpub last week. Once again, the Web Analytics Wednesday Global Sponsors (Coremetrics, Analytics Demystified, and SiteSpect) sponsored the event, which is always appreciated! 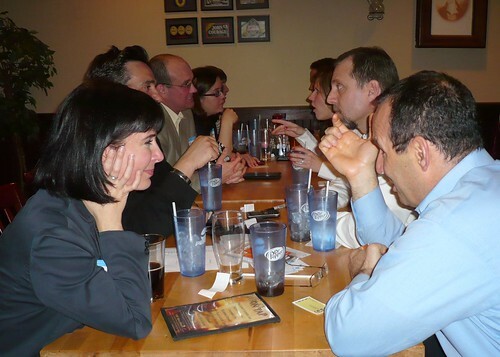 This month, in lieu of a formal topic, Dave Culbertson facilitated a round of speed networking — like speed dating, but with the purpose of driving interaction beyond everyone’s immediate tablemates. Each round lasted for 1 minute, and the main challenge was getting people to stop talking and shift on to the next person! It was a little intense, but Dave cut it off after 15-20 minutes, and the overwhelming consensus was that it was fun and useful! At the end of the exercise, Dave commented that he really hoped we could start extending these 1:1 connections and interactions through social media. As it is, Dave (@daveculbertson) is one of the most interesting people I follow on Twitter, especially when it comes to finding and tweeting links to content that I find interesting and informative. We’d actually thought ahead (if “six hours before the event” counts as “ahead”) and made a sign-up sheet that included a space for the attendees to write their Twitter usernames and indicate if it would be okay to post them. I then proceeded to leave the sign-in sheet behind when I left! Something about Barley’s — last month, I left my notebook behind and had to go and retrieve it the next day (2 beers over 2.5 hours plus a full meal…in case you’re wondering — it’s just something in the air there!). Pick your poison, one or all! Overall, the event had a great mix of both practicing web analysts (from companies like Resource Interactive, Highlights for Children, Victoria’s Secret, Lightbulb Interactive, Coldwell Banker, …and I’m just rattling off the companies I can remember, so this is an incomplete list) as well as some web analytics-centric companies: BizResearch, ClearSaleing, SearchSpring, and WebTech Analytics (all the way up from Cincinnati!). And, with a handful of sharp people in the crowd who are currently looking for full-time work, it was great that TeamBuilder Search came out as well! From a quick count of faces in my brain, the attendance broke down to be ~25% first-timers, ~25% loooonnnngg-time attendees, and 50% who have attended 1-5 times before. All in all, a great mix! The most-interesting-but-random site/tool that I learned about this month was City-Data.com — think The World Factbook, but for U.S. cities rather than for countries! And, with a slew of charts that are pretty clean and provide a pretty good way to get the flavor of a town — weather, jobs, houses, and so on. Sounds like I missed a pretty good one, that’s too bad. But when the soon to be in-laws are visiting and, to quote the lady, “Nothing is done” well, I reluctantly had to shift priorities. I would like to get into some deep discussions next time about certain topics. Maybe instead of doing one somewhat-broad topic, we can break up into 4-5 groups that cover something that may fit in better with what some people are dealing with. Some people may want campaign attribution, some others may want to talk about getting their analytics platform off the ground to begin with, another group may want to market their abilities better so they can get into the field in the first place. I’m sure there’s a group that would work well for certain people and not force everyone to talk about something they don’t care about. It seems like this was a good group meeting. Oh well, maybe another time. I am always looking t learn more.